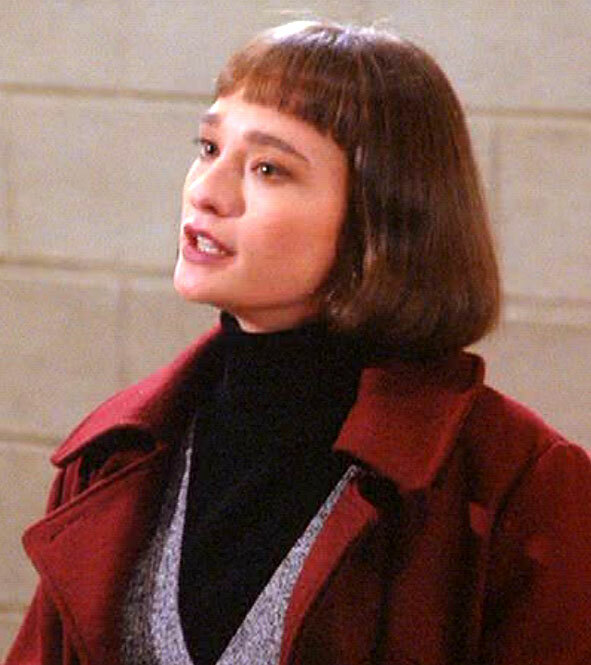 Linda Wallem appeared in ep #6.7 (“The Soup”) as ‘Hildy’, a waitress girlfriend of Kramer’s, who sullenly refuses to serve the gang their preferred lunches when they start to frequent her eatery. Although Wallem has a few acting credits on her resume, she’s better known as a writer, director and producer for shows such as Cybill, That ’70s Show, and Nurse Jackie (which she co-created). 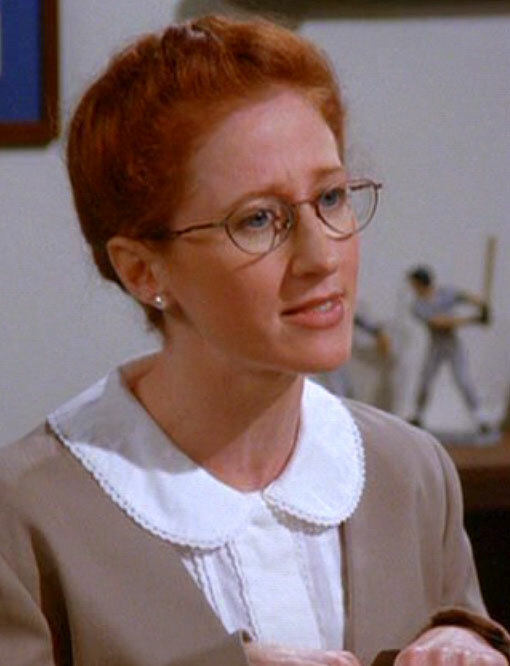 Vicki Lewis appeared in ep #6.9 (“The Secretary”) as ‘Ada’, the supposedly undesirable secretary that George hires, only to be seduced by her uber-efficiency. She then grasses him up to their big boss, after overhearing a conversation between George and a Communist lady he’s contacted through a personal ad in a “Red” newspaper. (#6.10, “The Race”) That episode also featured a cameo by Denise Poirier (aka Aeon Flux) as ‘Arlene’, an acquaintance Elaine tries to impress with her Bolshie boyfriend while out Christmas shopping. Charlotte Lewis appeared in ep #6.11 (“The Switch”) as ‘Nina’, a stunning supermodel girlfriend of George’s (! ), who he suspects of being bulimic. Jessica Tuck appeared in ep #6.12 as ‘Bonnie’, a girlfriend of George’s with a highly coveted velvet couch and fancy apartment, furnished by her pesky male room-mate. Barbara Alyn Woods appeared in ep #6.13 (“The Scofflaw”) as ‘Debby’, a woman on an awkward non-date with George. Wendie Malick appeared in ep #6.17 (“The Kiss Hello”) as ‘Wendy’, a physical therapist friend of Elaine’s with an old-fashioned hair-style that catches Kramer’s fancy… and her tongue-clicking receptionist was played by Carol Leifer, a stand-up comic who’s also worked as a writer and producer on such shows as Saturday Night Live, The Larry Sanders Show, and Devious Maids (as well as Seinfeld!) Meanwhile, Wendy Worthington appeared as ‘Louise’, one of several neighbours that Jerry snubs after Kramer attempts to get them all on a friendlier, first-name-greeting basis. Christa Miller appeared in ep #6.20 (“The Doodle”) as ‘Paula’, a girlfriend of George’s, who draws an unflattering cartoon of him. * Debra Jo Rupp appeared in ep #6.22 (“The Diplomat’s Club”) as ‘Katie’, a tour booker for Jerry who treats him like an out-of-touch celebrity. 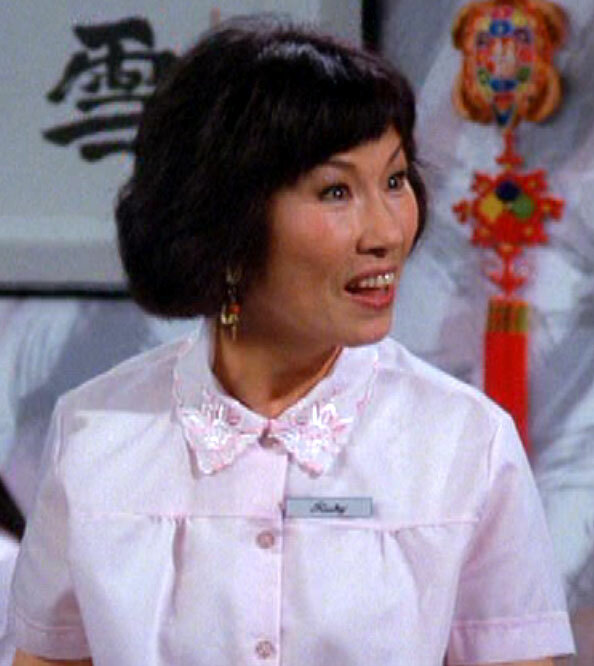 Finally, June Kyoto Lu (aka June Kyoko Lu) appeared in ep #6.24 (“The Understudy”) as ‘Ruby’, the meanie manager of a nail salon who makes mock of Elaine in Korean… while Amy Hill appeared as ‘Kim’, one of the salon’s staff-members, who also happens to be an ex-girlfriend of George’s father Frank! Oh, and Bette Midler as “herself”, of course, receiving the bum-rush from George during a friendly basketball game, and the fawning attention of a fanboy-ish Kramer. 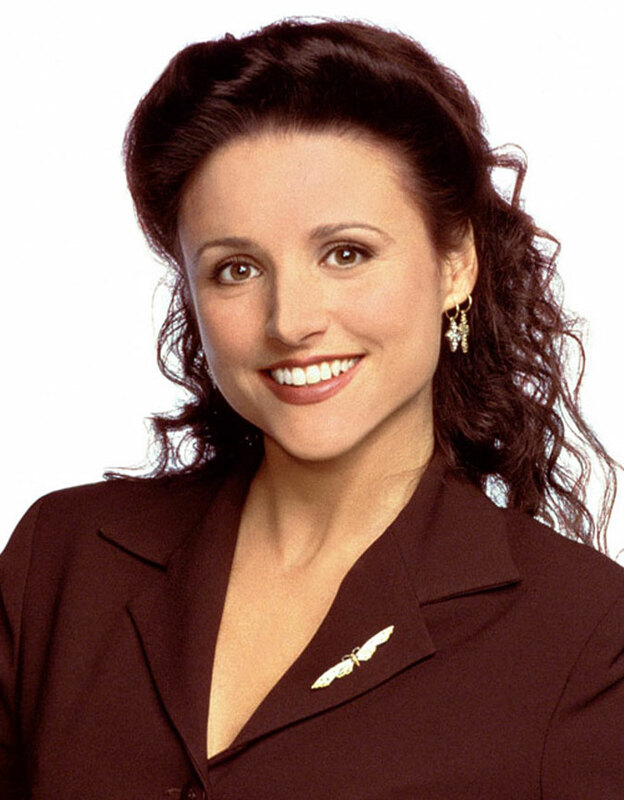 * Miller previously appeared in ep #5.4 (“The Sniffing Accountant”) as an executive at a company where George has a seemingly perfect interview, only to blow it by feeling the fabric of her blouse without consent… but it was such a small role, I didn’t bother mentioning it. Sorry. This entry was posted in Rants about Books, Rants about Films, Rants about TV and tagged Amy Hill, Barbara Alyn Woods, Bette Midler, Breakfast at Tiffany's, Carol Leifer, Charlotte Lewis, Christa Miller, Debra Jo Rupp, Denise Poirier, Elaine Benes, Elina Löwensohn, Jessica Hecht, Jessica Tuck, Julia Louis-Dreyfus, June Kyoko Lu, June Kyoto Lu, Lauren Bowles, Linda Wallem, Marguerite MacIntyre, Michelle Forbes, Seinfeld, Vicki Lewis, Wendie Malick, Wendy Worthington. Bookmark the permalink. Yeah… he’s gold, Jerry! Gold! !